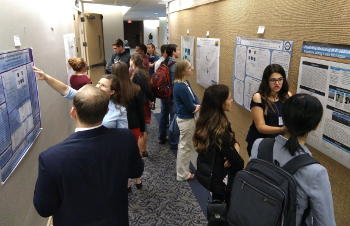 Objectives: The tenth annual undergraduate research conference provided opportunities for undergraduates to present their research at the interface of biology and mathematics. Student talks and posters were featured as well as a panel discussion on career opportunities, a graduate school showcase, and networking opportunities. Faculty and students were invited to attend, as well as high school teachers. Plenary Speaker: Holly Gaff, Biological Sciences, Old Dominion Univ. Click here for information about past conferences. Click here for past conference photos.